Cordell Bank National Marine Sanctuary is one of 14 federally designated underwater areas protected by NOAA's Office of National Marine Sanctuaries. Cordell Bank National Marine Sanctuary is an extremely productive marine area off the west coast of United States in northern California, just north of the Gulf of the Farallones. With its southern-most boundary located 42 miles north of San Francisco, the sanctuary is entirely offshore, with the eastern boundary six miles from shore and the western boundary 30 miles offshore. In total, the sanctuary protects an area of 1286 square miles. The centerpiece of the sanctuary is Cordell Bank, a four-and-a-half mile by nine-and-a-half mile rocky undersea feature located 22 miles west of the Point Reyes headlands. 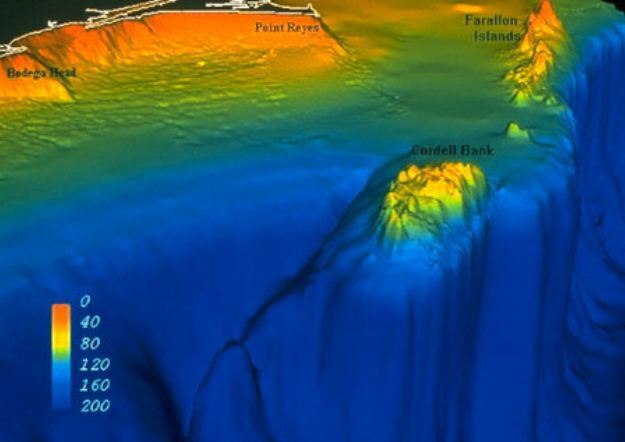 The bank sits at the edge of the continental shelf and rises abruptly from the soft sediments of the shelf to within 115 feet of the ocean surface. The combination of ocean conditions and undersea topography creates a rich and diverse marine community in the sanctuary. The prevailing California Current flows southward along the coast, and the annual upwelling of nutrient-rich deep ocean water supports the sanctuary's rich biological community of fishes, invertebrates, marine mammals and seabirds.